Hi guys! I hope your weeks have been great. Here are some things I’m loving lately – feel free to play along in the comments! 1) Leftover make-ahead breakfast burrito filling! 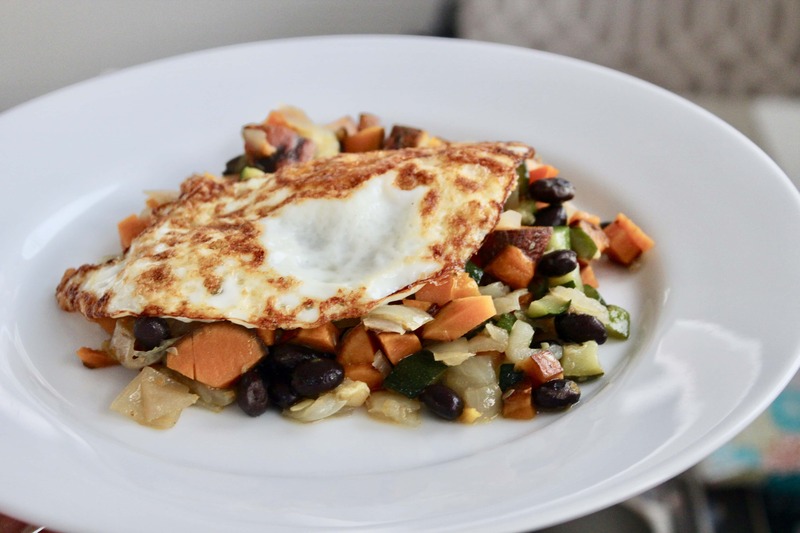 I had a bunch of roasted veggies (zucchini, onion, and pepper), black beans, and sweet potato leftover from making the burritos last weekend and I’ve been enjoying it as a hash of sorts with fried eggs on top. Yum! Riese has been snacking on it, too. 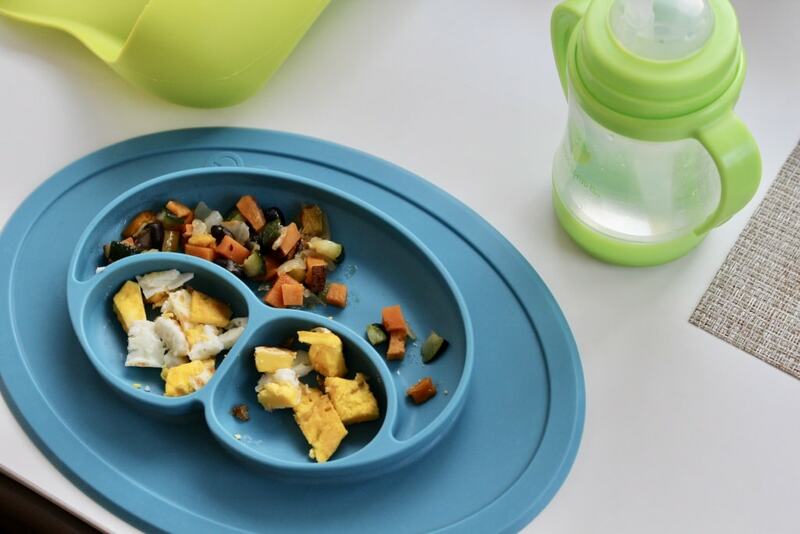 But before you get all “OMG her baby is such an adventurous eater why does my baby only eat bread?” – don’t worry, she only ate a few bites of this before trying to feed the rest to the dog. She especially hates beans which is a bummer because they are such easy protein. Oh well – I’ll keep offering! 2) This gorgeous warm front. We had weather in the 60’s a few days this week and it was so wonderful. What a treat to get to take my little love (and the dog, of course!) 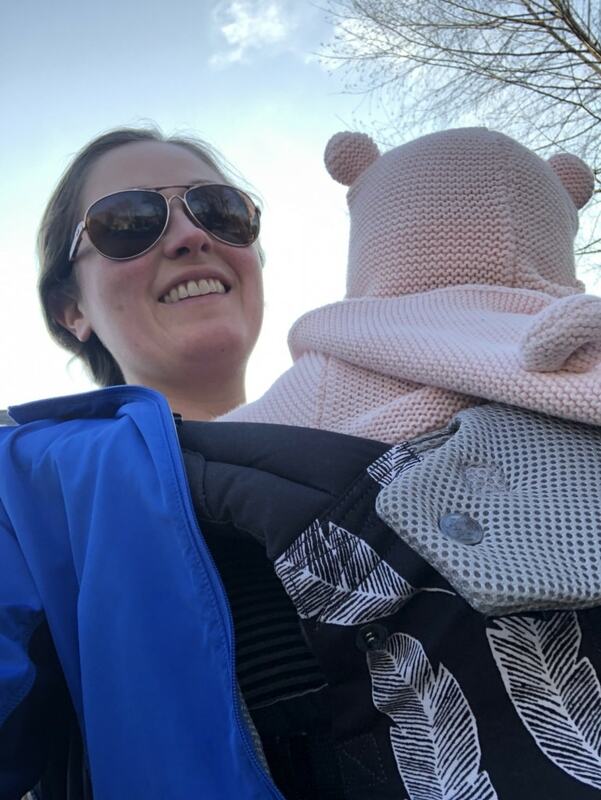 out on a bunch of walks! Warmer weather and sunshine does wonders for my mood (and for Riese’s, too). 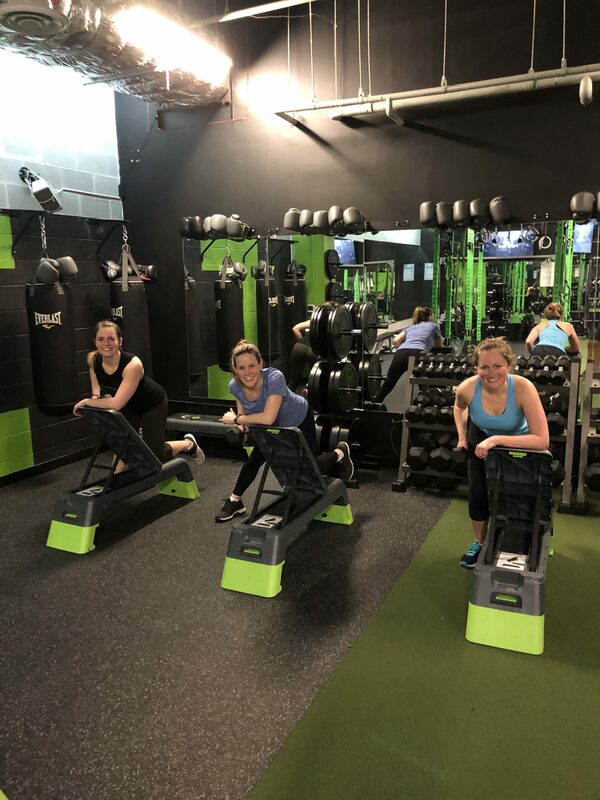 Yep, the three workout musketeers are still at it! We continue to meet up at least once a week, every week, for an early morning workout date. Crazy we have been at it for years now – I think we first started meeting up back in 2013?! Whoa. I don’t take many photos of our adventures anymore because we often go to the same places, but seeing them is always one of the highlights of my week. The front is still short but the back is growing like weeds. So random. Oh and yes, apparently there’s a hole in her shirt. 5) Getting in bed at 9 p.m.
I’ve been doing this most nights the past few weeks and it’s so lovely – especially since I’m usually getting up early to work out. Getting in bed at 9 means I have time to read for awhile before still going to bed on the early side, which is perfect. I’ve been finishing up Simplicity Parenting this week – really good read. Highly recommend to my parent readers! We’ve been having salmon once a week lately and I love it. 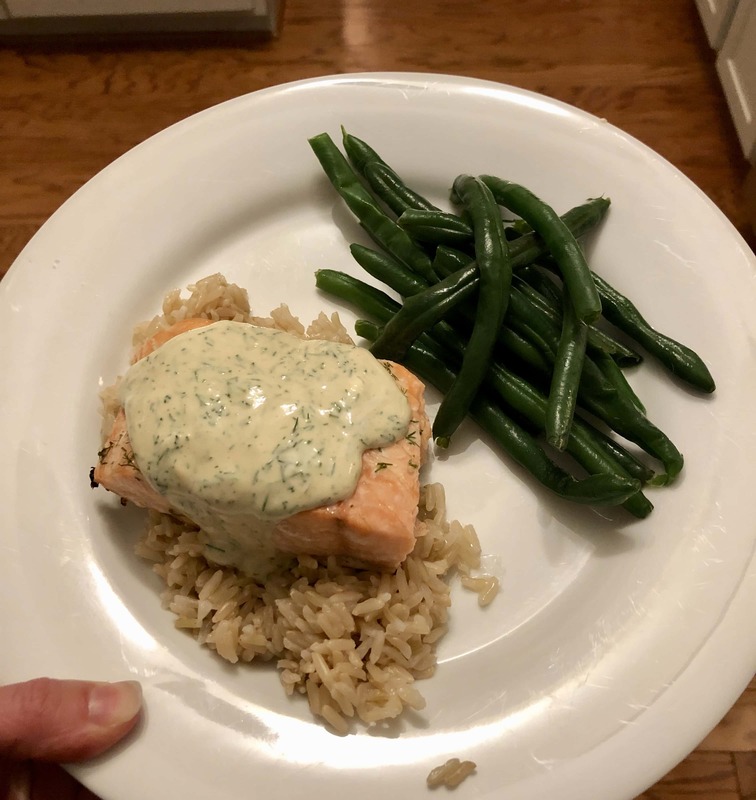 Last night, we had my old fave Salmon with Lemon Mustard Dill Sauce. Try it if you haven’t yet! That sauce – obsessed. I could eat it with a spoon! We have enough leftovers for today, too – hizzah! p.s. Have you guys tried making brown rice in the Instant Pot? I did last night and it was so much faster than making brown rice on the stove… 15 minutes vs. 40-45! I put in 1 cup of brown rice with 1.25 cups water and cooked for 15 minutes on high pressure. Came out great! And that’s all I have for you today! Hello! Did you change a setting in the last few days to truncate your posts when viewed in an RSS reader? Sad. Thanks for the reply. Since I read blogs at work while eating, I only read the ones I can see in a reader. Certainly understand your need for clicks though. I find your reply kind of odd. The op is obviously saddened by this decision but you respond with sunshine and rainbows (and of exclamation points!). I will say that after this comment I most likely will unsubscribe. Your blog has really become repetitive and unoriginal. There’s honestly little incentive to read if I have to click through. Best of luck to you. Sorry to hear you won’t be sticking around. p.s. When commenting on blogs, please remember that there is a real person with feelings behind it. If you want to let me know that it’s annoying to have to click through, that’s totally fine, and I will listen to and consider that feedback. But perhaps you could consider a kinder way to let me know that you would prefer some fresher, different content on my blog in the future. I’m always open to topic suggestions if you want to take the time to share more constructive thoughts about what you’d rather see here. It is of course your right but I am not a fan and it just means not reading – same here with clicking through at work and such. Plus, aren’t I also supporting by reading sponsored posts, clicking affiliate links, etc? Thanks for your feedback, Liz. I’m proud to support the blogs that I read by taking the extra 5 seconds to click through – I’d love if you’d do the same for me, but if you don’t have time, I totally get that. Thanks for sharing this feedback, and for being here when you can! Hi Anne. I commented above and then saw the subsequent comments later. For me, it’s not about “taking the extra 5 seconds” but rather that my work computer blocks a lot of sites because of the ads but doesn’t block RSS readers. Also, you did a really nice post about the income you make from the blog and how it has moved away from advertiser clicks so the timing of this just feels confusing to a very long time reader. Thank you so much for clarifying this for me, Jenn – I hadn’t thought about work computers blocking certain sites with ads and I didn’t realize it was an issue beyond just taking the time to click through. To explain a bit more where I was coming from with this change, my thought process was really just that I noticed the vast majority of the blogs that I follow have truncated feed posts, so I figured that if people didn’t care either way that it would be really helpful to me to have the extra traffic on my site. My site traffic impacts not just the actual income I make daily from my ads, but also the stats that I share with potential sponsors, so it impacts all aspects of my business. That said, I didn’t realize it was an issue for some of you in terms of being able to access the site on a work computer. I usually read blogs on my phone and from the looks of my stats most of my readers are on mobile as well, so I hadn’t thought about the work computer situation. I’ll give this some more thought. Thanks again for your input, I appreciate it! This post made me laugh. 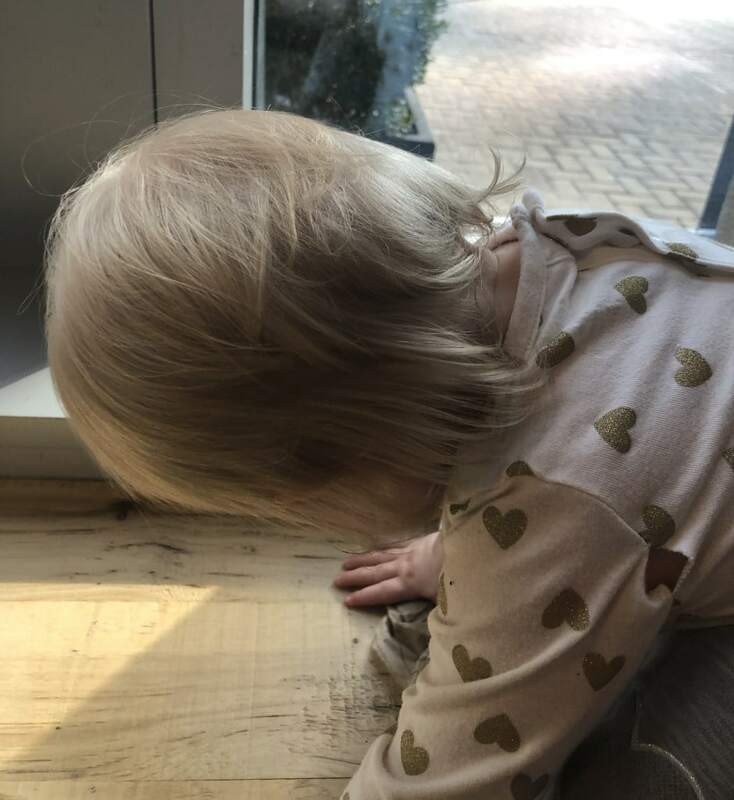 I have a 1.5 year old and can relate… the mullet and the hole in the shirt. Laughed out loud. Thanks for that!!! Salmon with that sauce sounds excellent. Loved the other favs, too! 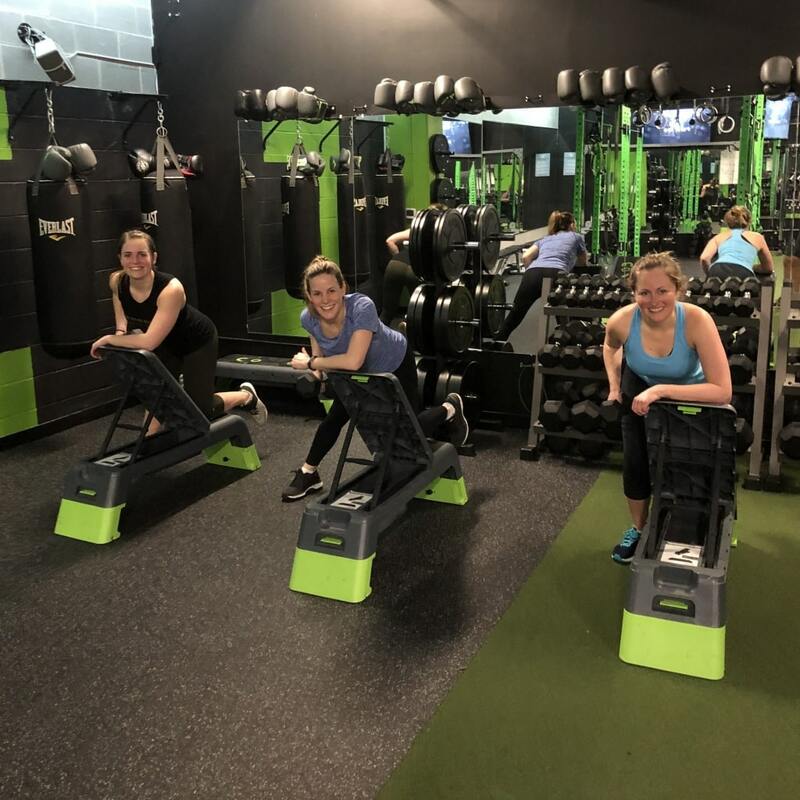 Kudos for getting out early with your workout buddies. Impressive! Sounds like 9 pm is the key! Healthy Sleep Habits, Happy Child and Simplicity Parenting are the only two parenting books anyone needs. I loved SP, and as my kids have gotten older we incorporate more suggestions into our lives. Such a great book! I’m definitely keeping it on hand to re-read as Riese gets older! Thank you for your feedback, Lindsay. I’ll think this over. Thanks for taking the time to click through and comment.